The team Witteveen+Bos, OKRA and ZJA has won the integral design tender for the Jaarbeursplein Utrecht and the underground parking. The vision of the winning team focusses on the realisation of the perfect parking, with a comfortable, lively, and socially safe city square on top of it, in which transfer and accommodation are designed in a recognizable and inviting way. Characteristic for the new Jaarbeursplein is a clever arrangement of the substantial flows of passengers; with strong relations between square space and the surrounding real estate; a square with a solid anchoring in the city, with logical connections between ground level, the world underground and the upper level of the public transport terminal. The Jaarbeursplein forms the face of the new Utrecht. 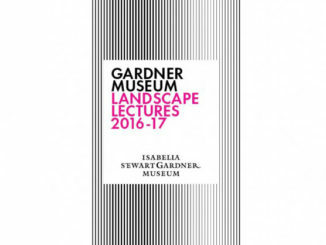 Vital, metropolitan and highly dynamic. A place where Utrecht shows itself, and where inhabitants and visitors can have a taste of the new city. Part of the winning entry is the square as the motor for future real estate development, with attention to the complete lifecycle for the development. During the next few years, in a number of steps, the Jaarbeursplein will transform from an existing residual space, to a high quality urban space. 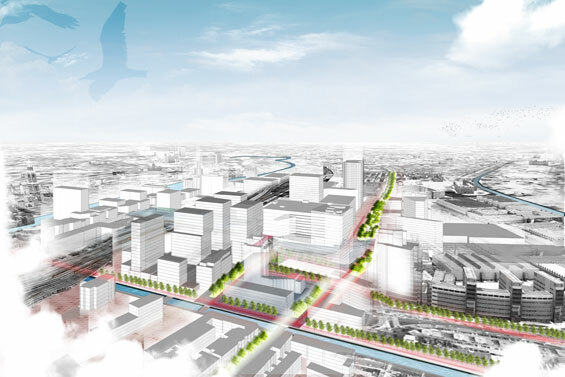 With the CU2030 program, the municipality of Utrecht together with its partners will work on a new station area, which later will form the new centre of Utrecht together with its historic city centre. The program involves a wide range of urban projects in which there is room for new infrastructure and public space, real estate developments and facilities. 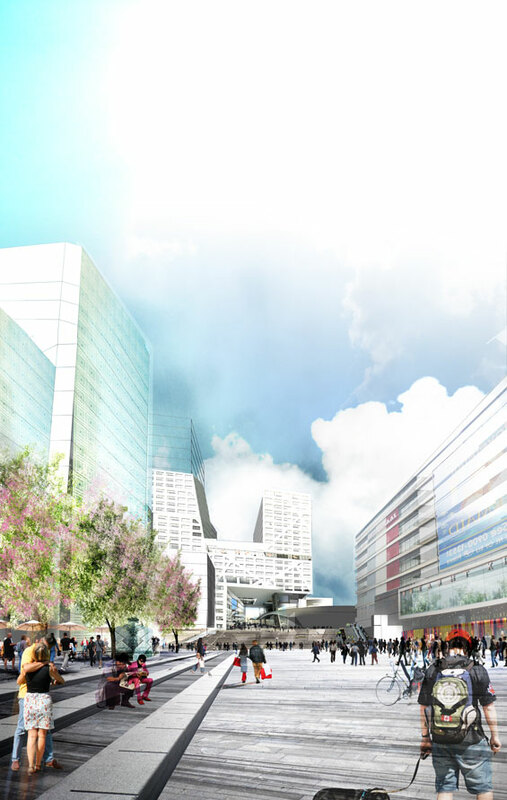 The redevelopment of the Jaarbeursplein and the construction of the connecting underground parking is one of the large integral challenges that are momentarily being prepared by the Project organization Station area at the West side of the central station. The opportunities lie in a strong interaction between inside and outside. The new square offers a view of the various functions around the square. The square offers space for outdoor activities of the Jaarbeurs and the Beatrixtheater. With the arrival of an almost 3,000 m2 retail and hospitality area on the ground floor of the Jaarbeursplein building, the North side of the square will definitely have an active plinth. Here are opportunities for a strong relation between inside and outside, such as large terraces at the square side of the building. With the construction of Station square West and the town hall, a more strongly enclosed space already comes about. From the Croeselaan, an almost foreign image arises, with large staircases spread over the entire square width, and the town hall rising above it. As soon as the developments around the Jaarbeursplein are a bit further in progress, the Beatrixtheater will also be provided with an upgrade of this square wall. This square wall could be the perfect wall for a façade-filling projection screen. The mixing functions in the Jaarbeurs district are an asset. Not just hospitality, theatre, cinema and casino, but also homes, hotels, offices, parking garages and of course the station itself. The viability on the Jaarbeurs square could be enlarged by providing housing program directly at the square. This way, the square can become a stronger part of the city. A mixture of offices and houses generates more liveliness during the day and especially in the evenings and increases the social control of the square. The Jaarbeursplein will transform from an existing residual space to a high-quality city square in a number of steps. Nice about this is that the use of the new square will also develop in time. Just like with the existing construction projects in the Station area, the construction of the parking garage and the construction of the square can be seen as an event. The nuisance can be eased by making the work activities visible and using art projects, playful actions or events to turn the negative image of an excavation pit into something positive. Constructing a parking garage at the most crowded place in Utrecht won’t be easy: the cyclist and pedestrian flows from and to the station will have to be secured during all stages of the construction. The first step in the realization will be clearing the grounds of all functions: moving cables and pipes, moving bicycle parkings and the bus square, and the diversion of the Croeselaan in combination with the possible early downgrading of a number of traffic flows on the Croeselaan. After the realization of the garage and the square, the Croeselaan presumably will still need to remain in function for construction traffic for West flank North, Jaarbeursplein building, hotel and Casino. A phasing of the Jaarbeursplein in an eastern and western part is the obvious choice here. Opportunities lay in an early opening of the garage, whereby the parts that are finished can immediately be taken into use and income can be generated.